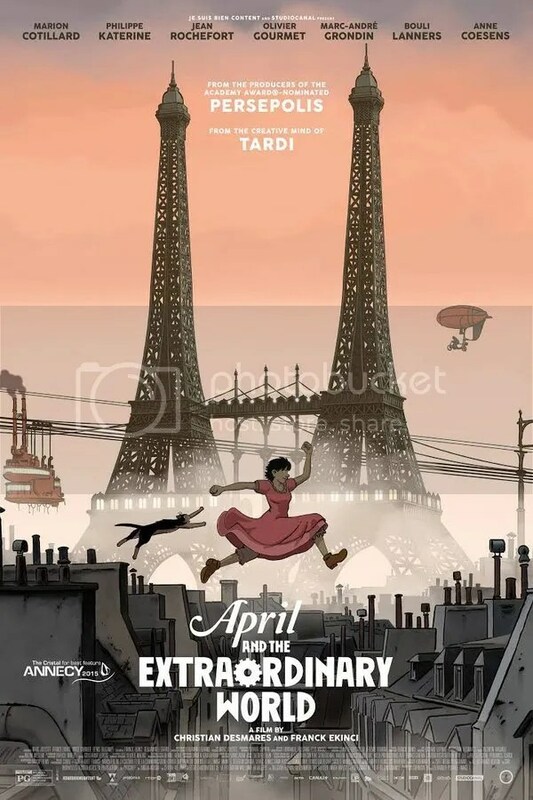 Jacques Tardi’s graphic novel is turned into a striking animated feature by the producers of Persepolis. This hypnotic sci-fi adventure is set in Paris, 1941, in an alternate steampunk universe where electricity hasn’t been discovered. As a result, society never advanced beyond coal and steam power. The mysterious systematic disappearance of the world’s top scientists is the cause. Our tale concerns April (voiced by Angela Galuppo, in the English language version). She lives with her dear cat, Darwin, who was scientifically imbued with human intelligence and a sarcastic voice to match. The majority of April and the Extraordinary World takes place 10 years after she loses touch with her scientist parents. April still hopes to find them one day. Meanwhile she secretly continues their experimental work. They were doing research on a longevity serum, which would grant immortality. The convoluted plot even has time to scold humanity for the damage caused by their evil coal driven industries. To be honest, the story is rather perfunctory. Ecological message movies preaching to save the planet are a dime a dozen. However beautifully hand drawn 2D animated features like this are not. Directors Franck Ekinci and Christian Desmares have fashioned a glorious universe in which the viewer can just get lost. Its strengths lie in visual delights that dazzle. They captivate the eye. My mind and emotions were less enthralled. The characters are cold and aloof, even the heroes. It’s creative fun though. The action employs the character DNA of Japanese anime mixed with the science fiction of Jules Verne. Although a couple of humanoid lizards wearing robot armor were reminiscent of reptilian creatures in He-Man and the Masters of the Universe. Aesthetes who worship at the altar of the aforementioned passions will find themselves in cartoon nirvana. More casual fans of such things (this critic, for example) should be entertained as well, but on a somewhat lower level. Note: I saw the U.S. English-language dub, featuring a voice cast of Paul Giamatti, Tony Hale, J.K. Simmons and Susan Sarandon. The original French-language release utilizes the voice talents of Marion Cotillard and Jean Rochefort. Have you ever been invited to a dinner party you didn’t want to attend, but you went anyway because you figured the aftermath of skipping it would be worse than the actual event? The Invitation concerns just such a get-together. As the story begins, Will (Logan Marshall-Green) and his girlfriend Kira (Emayatzy Corinealdi) are driving up the Hollywood Hills to his former home. His ex-wife Eden (Tammy Blanchard), is hosting an intimate soiree with her new husband David (Michiel Huisman). You can tell by Will’s demeanor that he’s dreading it. It’s been over two years since they’ve seen each other. The trip doesn’t get off to a good start. He accidentally hits a coyote on the way up and is forced to humanely kill the poor animal in order to put it out of its misery. The chance occurrence is random but it sets the tone. A smattering of guests show up at the intimate gathering. There’s a mixture of mutual friends and a couple of unfamiliar acquaintances present too. Will’s relationship with his ex-wife Eden is key. They share a tragedy. Eden’s relationship with her new husband David is important too. Throughout the course of the film we gradually develop an understanding of who these people are and what makes them tick. Director Karyn Kusama injects brief flashbacks of Will and Eden’s former life together and we start to understand more about what happened in their marriage. Then the guests play a variation of the party game “Never Have I Ever” called “I Want.” You’ve seen this type of material before. The soul searching thirty-somethings expressing their thoughts over wine and hors d’oeuvres. But what makes The Invitation so effective is how it confounds expectations. Writers Phil Hay and Matt Manfredi really take their time in establishing the characters. Hosts Eden and David are so cordial. Are they overtly so or is that just in our heads? Will senses something is amiss. He grows ever more anxious. There is a fair amount of build up. So much so that after awhile you may be checking your watch as to where all this is headed. Rest assured, the gradual unfolding of the narrative serves to make the denouement even more effective. Karyn Kusama is an American director who first made a critical splash with the independent Girlfight in 2000. Then went Hollywood with bigger budgets and did Æon Flux (2005) and Jennifer’s Body (2009). The Invitation would suggest that she’s at her best with smaller scale pictures free from studio interference. I haven’t gone into the point of The Invitation. That’s something the viewer needs to decide after watching. All I can say is, it most definitively made me feel something and I liked the experience. Addendum: I love awkward dinner party movies. Rope (1948), Guess Who’s Coming to Dinner (1967), Clue (1985). A small gathering of people can produce uneasy situations of clashing ideologies. It’s a self contained universe. Back in 2014, American writer/director James Ward Byrkit came out with Coherence. It was nifty little independent picture. 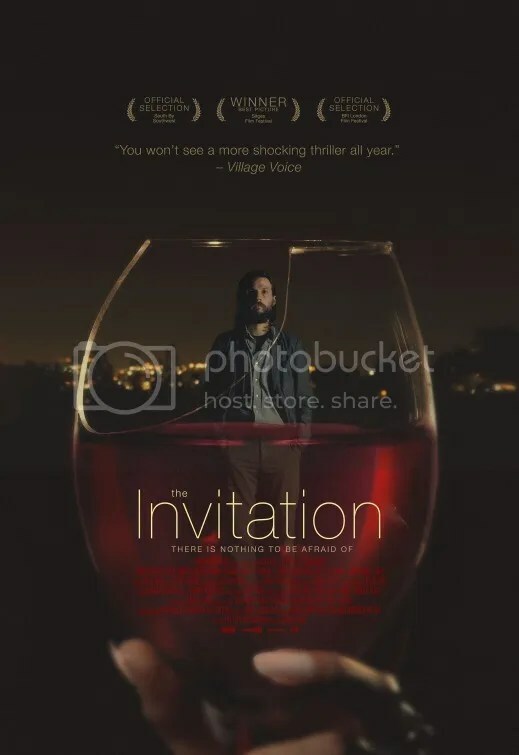 The Invitation reminded me of that film. You should watch them both. By now, Disney’s live action remakes of their classics have become so familiar, they constitute their own genre. There are at least 15 currently in the development stage. We’ve already seen Alice in Wonderland, Maleficent and Cinderella. Say hello to their latest: The Jungle Book. When adjusted for inflation, the original remains their 5th highest grossing animated film of all time following Snow White, 101 Dalmatians, The Lion King and Fantasia. The 1967 film has the legacy of a beloved treasure. This new version is fun too, a vivid spectacle for modern viewers. What The Jungle Book gets right is in the construction. It’s gorgeous. The production places the viewer right in the forests of India. The cinematic display of flora and fauna is rather breathtaking at times. The visual tableau is a optical wonder to experience. This accomplishment makes the ultimate realization that everything was actually filmed on a Los Angeles sound stage, fairly shocking. In fact, save for young actor Neel Sethi as Mowgli, there is little if anything organic on screen. This is a high-tech CGI curiosity to be sure in 2016. What truly makes the 1967 cartoon endure is that emotional component. This prodcution is fastiduously composed but it’s missing that spark. This is essentially a CGI copy of their hand drawn gem. Baloo (Bill Murray), Bagheera (Ben Kingsley), Shere Khan (Idris Elba), Kaa (Scarlett Johansson) and King Louie (Christopher Walken) are all here. Like the animated film, the animals talk. They even sing. “The Bare Necessities” and “I Wan’na Be Like You” both make an appearance. “Trust in Me” plays over the closing credits. There are adjustments, however. The animals have a decidedly more noble quality that sets them apart from the lighthearted buffoonery of the cartoon. Here King Louie is the much larger Gigantopithecus, a species now extinct, instead of an orangutan. Please! Those are not native to India, thank you very much. Kaa, formerly male, is now voiced by Scarlett Johansson. Sterling Holloway was a memorable Kaa, but I dare say Johansson makes the character her own. Her seductive voice is positively hypnotizing. When she tells Mowgli a story, I was captivated. I wanted to hear more. 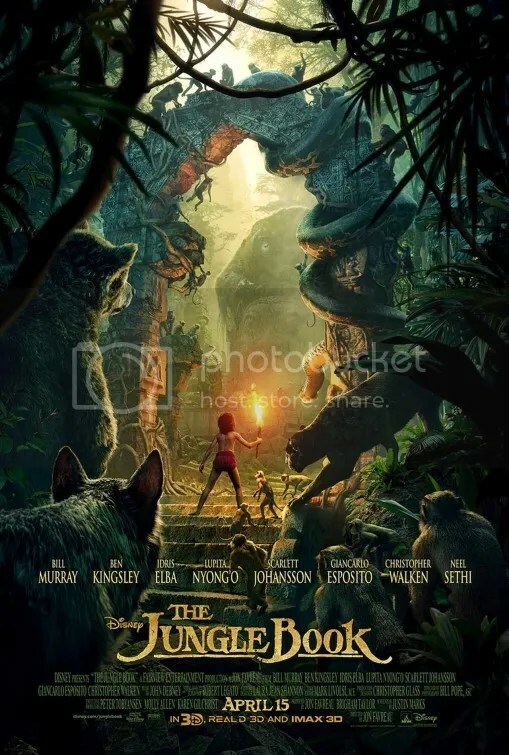 The Jungle Book is hampered by a narrative that can be reduced to “boy outwits tiger”. Rudyard Kipling’s book was a collection of tales in fact, as opposed to a sustained novel. Both the animated and live-action versions adhere to a series of vignettes where Mowgli interacts with various characters. While the cartoon was quite whimsical, with a referential eye toward the pop culture of its era, this adaptation is more realistic. Well except that the animals speak, obviously. But the intensity level is heightened. Mowgli is placed in more peril as the ferocity of Shere Khan is intensified. Buoyancy is replaced by darkness. These tweaks serve to distinguish this from the original, but the largely cosmetic changes don’t really elevate the production. They merely “correct” it. As such, The Jungle Book is indeed a technological marvel of our time. It’s a stunningly realized environment for families to appreciate and enjoy. Most assuredly an impressive accomplishment for today’s audiences. But will it achieve immortality as a classic 50 years from now? I have my doubts. It’s already an uphill battle when you ask your audience to sympathize with the problems of a privileged, white, good looking rich guy. It doesn’t help when he behaves like a first class jerk. In Demolition, Gyllenhaal plays Davis Mitchell, a successful investment banker whose wife Julia (Heather Lind) is killed in a car accident. That’s a genuine tragedy, but then he can’t summon up the emotion to even miss her. Instead of mourning her loss like a normal human being, he spends his free time writing a succession of complaint letters. The missives are addressed to a vending machine company that stole his 6 quarters. He wanted a bag of peanut M&M’s while waiting in the hospital where he wife was pronounced dead. His confessional mail writing campaign finds its way to the desk of Karen Moreno (Naomi Watts), a customer service representative. 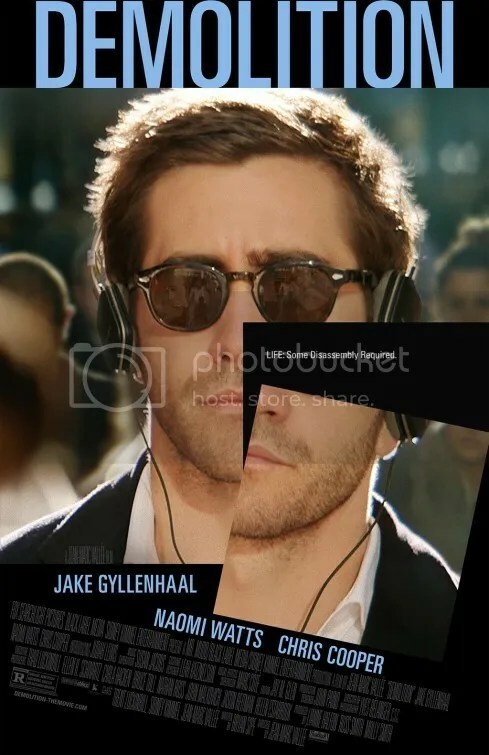 It helps to acknowledge that Davis is mentally ill. Jake Gyllenhaal was a sociopath in 2014’s Nightcrawler and he’s basically one here too, albeit one with a more passive nature. Julia’s parents are nearly paralyzed by the loss of their only child. Davis? Meh, he couldn’t give a care. The fact that he cooly disregards his in-laws’ grief merely intensifies our disgust. His wife’s father, Phil (Chris Cooper), is also his boss. He’s the sole person in this entire woebegone film with whom we can feel some compassion. His exasperation with Davis matches ours. Karen contacts Davis late one night after having been moved by the candor of his words. His complaint letter describes his life in self-serving dolorous detail. A friendship (nothing more, to the film’s credit) blossoms between the two. Unfortunately the script portrays her as little more than a self-absorbed pothead. The relationship gives Davis an opportunity to meet Chris (Judah Lewis), Karen’s quirky teenage son. The plot is already overstuffed with weighty themes that are superficially handled, but let’s add some more shall we? Chris is a wacky, hard rock loving, f-bomb dropping tyke, confused by his own sexuality. That last topic is raised, exploited and then casually discarded a few sentences later without further consideration. Instead Davis encourages young Chris to shoot him with a actual gun while he wears a bulletproof vest. Don’t ask. It doesn’t make any sense in the movie either. Although that’ll be a great story for the child to tell his inevitable psychiatrist. Is it possible to create a story that captivates our hearts without a single likable character? I suppose, but Demolition doesn’t even come remotely close. Davis’ all-encompassing indifference corresponds to our apathy for him. He is an insufferable individual. Smug and self satisfied, it’s impossible to feel any sadness for a man so emotionally vacant. Particularly late in the chronicle when he is physically demolishing the value of his extravagant home, first by taking a mallet to it and then a bulldozer. Whee! It’s fun to destroy things. The screenplay by Bryan Sipe (The Choice) never delves into what makes Davis tick. As a result we have no clearer understanding as to what this guy’s problem is at the end, than we were at the beginning. That doesn’t prevent this wasted cinematic exercise from giving us a neat little happy conclusion that unexpectedly materializes out of the heavens. It conveniently ignores the very foundation of Davis’ personality. The contrived ending is the insincere kiss on the lips after a 101 minute beating. Roy (Michael Shannon) and Lucas (Joel Edgerton) are waiting for the sun to go down in a darkened motel room. A television is on in the background. As we listen to a news report, we learn these very men have kidnapped an 8-year-old named Alton (Jaeden Lieberher). He sits reading comics with bizarre blue goggles over his eyes and noise canceling headphones on his head. Day turns into night and now they’re on the move again. A religious group and the federal government are both involved as well. Everyone seems preoccupied with the fate of this special little boy. It’s not even clear for awhile where our sympathies should lie. For example, is Roy a good guy or a bad guy? To even reveal that would be a disservice to the story. The pleasure of this slow burn thriller is in the way it slowly disseminates information so that the audiences gradually understand what’s going on as developments arise. Our minds are held captive by the truth. The trick is how much to reveal and how soon. Midnight Special does a pretty outstanding job at keeping us interested for the majority of its run time. It’s fascinating how “wanting to know more” fuels our appetite. There are well placed reveals throughout and these have the power to satiate our desire. Director Jeff Nichols shows remarkable restraint. The full scope of the chronicle is a gradual understanding. Less is more. If you were to boil Midnight Special down to its very essence, it’s essentially a chase movie. But there is beauty in simplicity. Nichols has always been a visual story teller and his latest is no different. This is his 4th directorial effort. The drama manipulates sci-fi into a tale about family. The spirit of Steven Spielberg permeates the account. As such it’s Nichols’ most accessible movie. Actor Michael Shannon has been featured in all of the director’s films. He’s appropriately intense. Kudos also to young Jaeden Lieberher as the enigmatic little boy. He was the central child at the focus of the wonderful 2014 comedy St. Vincent as well. 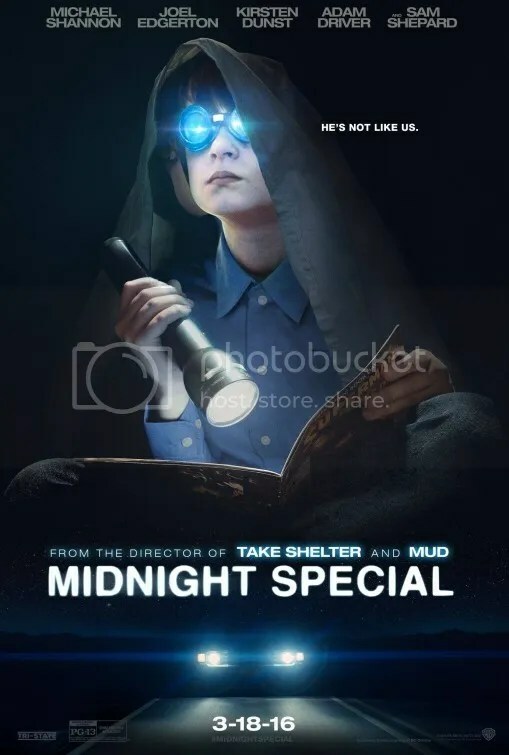 What keeps Midnight Special from achieving greatness is that you ultimately need to have some sort of an ending. That’s the difficult part in a narrative that’s all about the journey. I liked being in the dark, but the script ultimately betrays its own ambiguity. It gives us a destination. This could have been handled differently. The resolution is a little too, hmmm shall we say, specific in this case. It’s the finishing misstep that ultimately lingers in a movie that is mostly captivating. 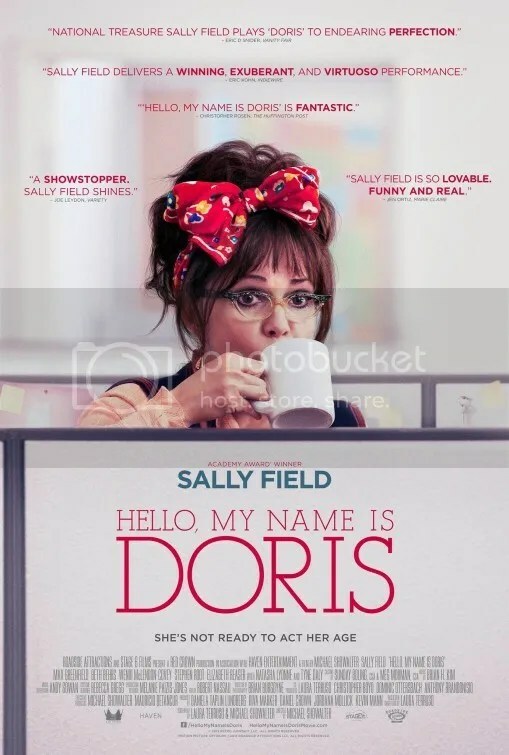 Hello, My Name Is Doris is a whimsical misfit comedy that could have formed the basis for a pretty funny sitcom. It’s precious and cute, full of clever observations about what it means to be “out-of-step” with the world. Meet Doris Miller (Sally Field) a sixty something never-been-married accountant . She has spent her life taking care of her sick mother at the expense of her own happiness. She continues to work but appears close to the age of retirement, if not past it. Compared with the similarity of age and style of her budding co-workers, she sticks out. She’s “quirky”. Enter handsome new office art director John Fremont (Max Greenfield). He’s a much younger man in his 30s. She’s smitten but shy. However after she gets inspiration from a self-help guru (Peter Gallagher), she decides to pursue him. Director Michael Showalter is an actor/comedian who first came to recognition in the early 90s as a cast member on the sketch comedy series The State on MTV. He also wrote and starred in Wet Hot American Summer. Hello, My Name Is Doris is brimming with vignettes that poke fun at her awkward demeanor. There’s a scene where John helps Doris pump up the exercise ball while she’s sitting on it at her cubicle. The scene is a visual riot of physical comedy. On several occasions her romantic escapades are suddenly revealed to be nothing more than a fantasy. I was never fooled for a second by these developments because the chronicle stays firmly rooted in a grounded sensibility. Occasionally it can be cruelly serious. At one point, Doris’ oddly insensitive therapist (Elizabeth Reaser) arrives to help her get rid of the excess junk she has accumulated over the years. Doris’ subsequent breakdown is heartbreaking. Hello, My Name Is Doris is one of those life affirming character studies that begs you embrace it like a warm hug. The idea of a senior citizen aggressively pursuing a man half her age is a bit incongruous. The fact that John truly enjoys her company keeps her optimism flowing. The script clearly wants us to laugh at her delusional behavior. In the hands of Sally Field, the individual is rather delightful. Actress Tyne Daly plays Roz, Doris’ best friend. Roz isn’t afraid to dish out some tough love truth. She’s pretty wonderful in her part too. The problem is, Doris veers a little too close to pathos for comfort. Her crush develops into something so intense that her unmarried hoarder personality veers into the uncomfortably pitiful. There’s a thin line between love and stalking. Nevertheless, it’s an absolute joy to see the veteran actress, who turns 70 this fall, be the star of a movie. Sally Field is fantastic and the #1 reason why I still heartily recommend this film.